At the launch of Ethereum in July 2015, smart contracts were welcomed as revolutionary — promising trustless, automated transactions in industries as diverse as social media and supply chain management. Since then, the price has soared, and for many the metric for success has become not levels of adoption, but the size of the market cap. However, the promise of smart contracts has not been forgotten, and three years after Ethereum's launch, institutional trading platform SFOX have released a report that assesses the metric that really matters: the number of transactions. 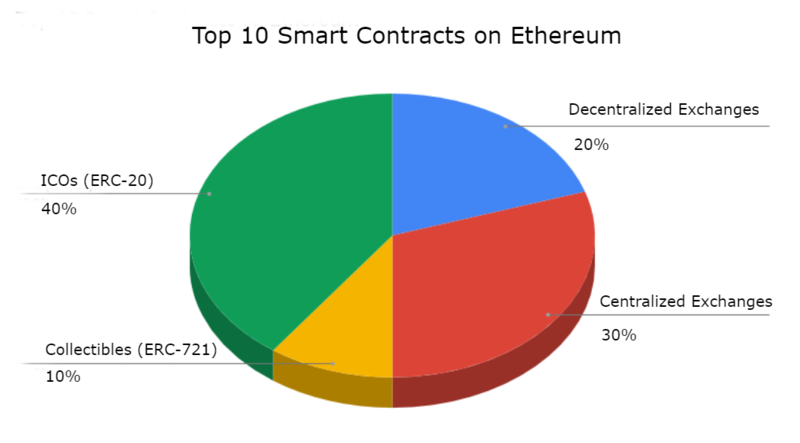 As it turns out, the top ten highest-transacting smart contracts have a range of different functions, but all belong to either cryptocurrency exchanges, ICOs, or crypto-collectibles. Most smart contracts, it turns out, are not performing any revolutionary function — but simply moving Ether between addresses, exchanging Ether for other cryptocurrencies, and swapping Ether for Ethereum-based tokens. At the top of the charts, the highest transacting smart contracts are on decentralised exchanges — Etherdelta and IDEX, both of which rely heavily on smart contracts to execute trades directly on the Ethereum blockchain. The number one smart contract, which has processed over ten million transactions, is part of Etherdelta, a DEX that has rapidly gained popularity for hosting new tokens that are difficult to get elsewhere. Close behind is the IDEX smart contract, with over four and a half million transactions. However, even with a daily trade volume of 209 BTC (1,343,908.35 USD), IDEX — which is reportedly the number 1 Dapp in the world by volume — pales in comparison to centralised counterparts like Binance, which posts a daily trade volume of 104,410 BTC ($672,532,424 USD) and is thought to have more than eight million users. Given the recent trend for leading exchanges to announce their own decentralised counterparts, we could expect the use of smart contracts in this sector to continue to grow. Binance released a demo of its decentralised exchange in August, which will be built on its own blockchain, and Bitfinex have released a "trustless trading platform" built on Ethereum — Ethfinex. Unsurprisingly, the second major use of smart contracts is for ICOs — where they are frequently used for the automated release of ERC 20 tokens. The smart contracts used to facilitate the EOS, Tron, and OmiseGo token sales have all made it into the top ten in terms of numbers of transactions. With almost three million transactions, the EOS smart contract is ranked number three by total transactions and number two by uniques. Having secured a record 4 billion in a year-long ICO, it is not surprising that this contract is also ranked number one by revenue. If the ICO mania of 2017 is cooling off, as some data suggests, then this sector of smart contract use could be set to reduce. Cryptokitties, which famously congested the Ethereum network last December, is responsible for the fourth highest transacting smart contract, which accounts for about 2.6M transactions — lower than EOS, but higher than Tron. Although such numbers for a prototype peer-to-peer marketplace are promising, they seem unlikely to last — interest in the game has waned in recent months as the market has fallen. "While smart contracts are a powerful tool that has the potential to change the world of finance, the technology is still early. The Ethereum network has scaling issues, making it expensive to execute smart contracts in times of high network congestion. Meanwhile, developers have to be mindful of a number of security issues that can lead to costly failures."